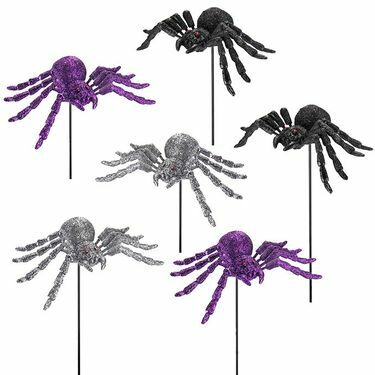 Send shivers and holiday chills down the necks of your Halloween visitors with a fun assortment of our popular Spooky Spider Garden Stakes! Each fantastic glitter spider has 8 springs legs for extra creepy crawling motion. Removable garden stakes allow you to place them on the ground as well or somewhere else unsuspecting. Each set come with 2 purple, 2 silver, and 2 black spider stakes! Get ready to surprise your friends - both creepy and whimsically glittery!